Here’s someone who became one today and started a new journey. 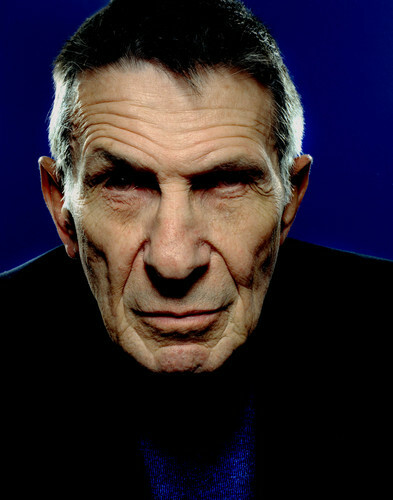 Leonard Nimoy passed away today, at 83 years old. He would have been 84 next month, on March 26th. Of course, you all know him as Mr. Spock from Star Trek and that is perhaps his most enduring legacy: a much loved character who’s become a part of popular culture. The Vulcan salute, the logical take on things and Spock’s famous greeting, all have been constantly emulated at some level by multiple generations and even if you’re not a trekky. For many, he was and still is an inspiration of sorts, from stargazers and astronomy lovers to students and researchers, including the folks on NASA, who acknowledged as much today on Twitter. Fellow polytheists have also been showing their feelings towards Leonard Nimoy and I reckon there are some who wouldn’t mind granting him an apotheosis. Which would be fitting, if you think about it, since some of the ancient heroes were given a constellation and the man who gave life to Mr. Spock is a fitting candidate for a place among the stars. In fact, feel free to suggest the International Astronomical Union to name a constellation or galaxy after Leonard Nimoy, either by email, Facebook message or tweet. And if you want to add him to your pantheon of heroes and divine dead, feel free to do so as well. From a polytheistic point of view, there’s nothing wrong with that, as explained before. This is not monotheism, where being a god is a monopoly of one entity or an issue of restrictive dogma. A landwight, one’s ancestors and even a deceased with whom you have no family ties are gods too. And as someone with an enduring legacy that touches millions in a positive way, he’s certainly a fitting candidate for divine honours outside his family. So live long and prosper! And have a safe journey on your new adventure, Leonard Nimoy. Thrusters on full! There’s some debate on the upcoming Thor movie. Of course, it’s a cinematic rendering of the Marvel comics’ character, but some in the heathen world as well as white supremacists are shocked at the news that the god Heimdall will be played by a black actor. On December, Jason posted about the issue in his Wild Hunt blog and new comments are still popping up occasionally. And all the while I find myself wondering how easily people assume religion is a stiff, fossilized thing, governed by unrealistic notions of purity. Yes, it is somewhat shocking to see Heimdall as a black figure, especially since Snorri calls Him hvíti áss, the white god. But it’s shocking to me only in the sense that it is unexpected, a new way of depicting this enigmatic Norse deity. Because, truth be told, representations of any god have been as diverse as the cultures and ages that pay them homage; sometimes even radically so and occasionally in the same country at the same time. A good example of it is the bodhisattva Avalokitesvara, a popular deity-like figure in Mahayana and Vajrayana Buddhism and even in some places where the Theravada tradition is dominant. The exact history of His origin is uncertain, but it is probably Indian. What is known is that this particular deity gained worship anywhere Mahayana Buddhism reached and in very different forms: in Tibet, He’s also known as Chenrezig and the Dalai Lamas have been considered a reincarnation of Avalokitesvara for centuries; in China His name was translated as Guanyin and took both the female and male form. Yes, both sexes! She’s Cundi and Kuan Yin, a very popular Goddess of Compassion; but in Japan, He’s Kannon. This is what happens when different cultures take on the same god. The same can be told of other deities. The Persian Mithras had a mystery cult in the Roman world that appears to be unheard of in His native Persia, and Isis, though originally Egyptian, once in Rome came to be depicted in a more classical fashion, more to the Roman liking (see here, for instance). In Gandhara, Graeco-Buddhist art depicted the bodhisattva Vajrapani as Hercules, club and everything (see here, for instance). Even the Abrahamic god is both undepicted and depicted: Jews and Muslims refuse to reduce Him to the forms of human art, but Catholics have historically done it for centuries, be it on the ceiling of the Sistine Chapel, in this equally bearded Spanish version, or as the medieval hand stretching out from the heavens. And in modern Japan, the popular kami Inari is depicted as a woman, a man, or a fox in both Shinto and Buddhist contexts. I’m aware, of course, that none of this ever happened to the Norse Gods. Not that there are many surviving pre-Christian depictions of Them with colours, but I’m willing to concede that, in the old days, They were represented with the physical traits of Their worshippers: light skin and blonde, black, or red-haired (the latter being the case of Thor). But what those same modern heathens fail to consider is why. Why were the Norse Gods depicted like the Norse people and never in a “foreign” way? Is it because They demanded to be represented in that fashion or, on the contrary, because no Asian, Northern African, or even Southern European is known to have worshipped Them? And did that happen because there was a sense of “racial loyalty” or because the Norse were so up north that they never entered the cultural melting pot that was the Mediterranean and the Eastern Hellenist kingdoms? Perhaps we should look at the Rhine and Danube regions and see how Germanic deities were depicted in a Roman fashion; like the Matronae, for instance, possibly linked to the Disir. And if this happened in an area of contact between the Germanic and Latin worlds, what would have happened if Scandinavia had been in close contact with African cultures to the point of exchanging religious practices? In the end, the Gods naturally assume the forms (and often norms) of the cultures that embrace Them, sometimes taking on looks that may be unfamiliar to other worshippers of Theirs. If historically that never happened with the Norse Gods, that has more to do with the geographical and relatively isolated position of the European far north than with any notion of racial, ethnic, or religious purity. Religion is both tradition and fluidity; it has stable elements, but it also has changeable parts and art is one of them. So in a world that has become a small village, where people of colour are naturally present in societies that used to be almost exclusively white, why shouldn’t Heimdall be depicted as black? He may be an unlikely choice, but that doesn’t justify the uproar.